I can show you a path to realize that vision. I provide fractional / on-demand product and technology leadership services in Atlanta to non-technical entrepreneurs and emerging businesses. I apply my broad experience to drive the development and launch of software products and services. You can see more of my work on my general portfolio page. If you're interested in mobile apps, you can see them on my mobile portfolio page. You can also see some web application examples on my web app portfolio page. 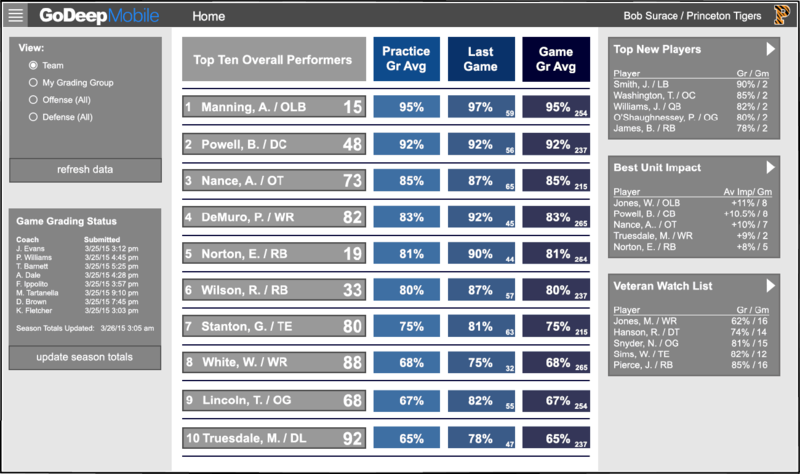 The GoDeep Mobile Application is a web application that helps football coaches grade film, communicate grades and coaching notes to players, and analyze player performance with a very high level of precision. I served as the fractional/interim CTO for Domino Solutions. A key deliverable of my tenure was in the selection and integration of a Business Intelligence solution into their enterprise marketing web application. I use rapid prototyping tools and techniques to quickly show a working concept. I use modern Agile and Lean Startup methodologies to build modern web apps, mobile apps, and API servers. I build custom web apps and mobile apps starting from conception thru all development phases of software development into production. I build and scale multi-disciplinary teams including employees, contractors, and outsourcing partners. I lead, transform, and optimize entire R&D organizations. I create force multipliers using strategic outsourcing while protecting intellectual property and core skills.